Colada Shop DC’s colorful facade. Photo by Rey Lopez. Thinking of Cuban food, we conjure up the island’s famed sandwiches, strong coffee and sugary rum cocktails. But Cuban food is so much more; it’s a confluence of cultures, ideas and people, mashed together to delicious effect. “The history of Cuban cuisine has incredible influence from around the world, from Africa to Spain, Portugal and France,” says Mario Monte, chef and co-owner of Colada Shop. Monte, who was born in Miami to a Cuban father and Italian mother, doesn’t seem at all surprised by the uptick in Cuban outposts around the District. “The resurgence of popularity in this pearl of an island just proves that how good its flavorful origins are as well as the vibrancy of its people,” he says. Now, Washingtonians can experience more Cuban flavors at a number of spots around the DMV. We’ve rounded up the best of the new. Colada Shop DC’s croquetas preparadas. Photo by Brian Oh. Coladas and conversation come easy at this 14th Street NW Corridor café. But Colada Shop serves more than just rum-drenched cocktails. This colorful shop from Barmini alum Juan Coronado, chef Mario Monte and Daniella Senior opened its doors (and walk-up bar window) to the District last February following the success of its original shop in Sterling, VA.
During the day, the shop brews the real-deal Colada—four shots of espresso sweetened with sweet crema and served with demitasse cups to share—as well as other caffeinated Cuban favorites like a cortadito (espresso steamed evaporated milk and foam) and café Cubano, a shot of coffee sweetened with crema. Start your day with a potato and sofrito tortilla or a classic Cuban tostada. For lunch, the shop offers a lineup of sandwiches like the famous Cubano (ham, slow-roasted pork, Swiss cheese, mustard, pickles and cilantro on Cuban-style bread) or the croqueta preparada (crispy chicken croquet served over ham and Swiss). Late-risers can snag empanadas, croquetas or pastelitos at any time. By night, rum cocktails flow to Caribbean beats and spending time here with friends is hard to beat. Little Havana beckons diners in with colorful murals. When Alfredo Solis and Joseph Osario teamed up to open Little Havana, a colorful Cuban eatery in Columbia Heights, their mission was to bring Cubano food to the district. The space is a multichromatic celebration of Latin American culture. The walls are adorned with murals by artist Ernesto Zelaya, who painted portraits of Cuban icons including revolutionary leader Che Guevara, Washington Nationals pitcher Gio Gonzalez and “Queen of Salsa” Celia Cruz. But the food here is the main attraction. Hearty dishes like braised oxtail, Cuban chicken stew, jerk salmon and guava barbecued ribs showcase Cuban home cooking and the lineup of sandwiches includes the iconic Cubano as well other versions brimming with slow-roasted shredded pork, grilled chicken or chorizo. Shaking your cocktails is Copycat Co. veteran Heriberto Casasanero, who’s taking tiki seriously, serving up rum-focused drinks in frozen pineapples and coconuts. In Cuba, when people play the lottery or make bets they place their fate in la charada china, a mystical guide of numbers and pictures deeply rooted in Cuban superstition. When Havana-born chef Raynold Mendizábal opened El Sapo in Silver Spring last year, he bet on the number 22. Mendizábal, who’s also the chef at the nearby Urban Butcher, opened El Sapo exactly 22 years after fleeing Cuba and stepping onto American soil. According to la charada china, the number 22 corresponds to el sapo: the toad. Mendizábal has said that he wants his guests to entrar bailando, or “come in dancing.” And even for those of us with two left feet, it’s hard to resist the rhythm here. As you enter, Latin music and mojitos fill every corner. Mendizábal’s meat-heavy menu highlights both the foods of his childhood and the foods that defined his culinary journey from Cuba to the United States. You will find the Cuban national dish, puerco asado (roasted pork) as well as Mendizábal’s favorite childhood dish rabo encendio (fiery oxtails). Drinks flow freely from the rum cart, and the chef makes sure meals wrap up with their famous cortaditos or Cuban coffee, ensuring you leave the same way you entered: dancing to the music. “Hanami” like a pro: Our tips, an event round-up & a cheery cherry Cosmo recipe! The Tidal Basin full bloom. Photo by Hannah Hudson. The annual National Cherry Blossom Festival is peak outdoor time, with stunning rosy vistas of trees are transformed into clouds. And DC doesn’t disappoint locals and tourists with ample opportunities for hanami, the Japanese word for cherry blossom viewing. Although the stars of the celebration are the flowering trees, this annual festival encourages us to welcome spring with arms wide open and remember the international spirit of goodwill that spurred Mayor Yukio Ozaki of Tokyo to give 3,000 cherry blossom trees to the United States in 1912. The Tidal Basin is a classic destination—though to beat the crowds, you might want to come very early in the morning or late in the evening. You could even arrange a yozakura, or a nighttime hanami celebration, with your friends. So, how to enjoy? We’ve got ideas. 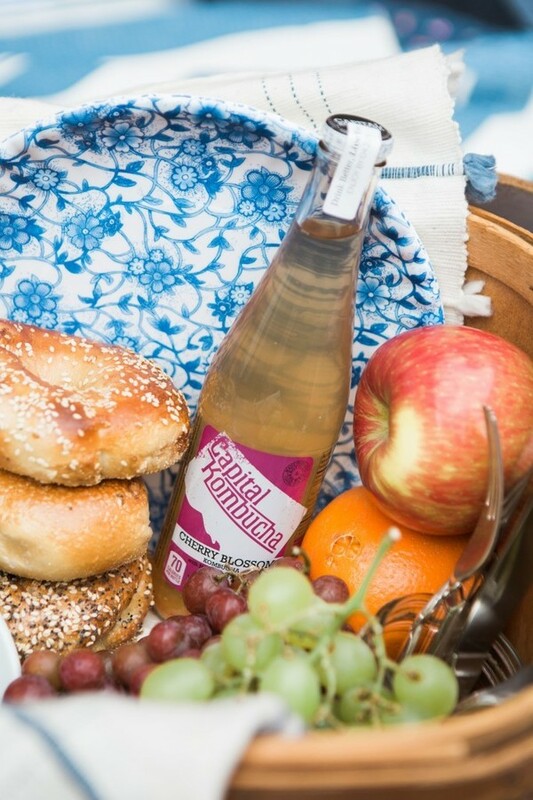 Build an all local picnic basket and think pink! Some of Edible DC’s favorite local rosés would be great additions to your hanami picnic basket: check out rosés from Early Mountain Vineyards, Walsh Family Wine, and others here. Last but not least…check out the delicate spring produce from your local farmers markets! With the tender season comes a wealth of new offerings at the DMV’s many local farmers markets. Here’s a list of some of our favorites. Or...go out and try the seasonal specials, events and classes at local restaurants! Reknowned Chef Daniel Boulud and Executive Chef Nicholas Tang are hosting a special dinner on April 5 at DBGB in CityCenter DC. 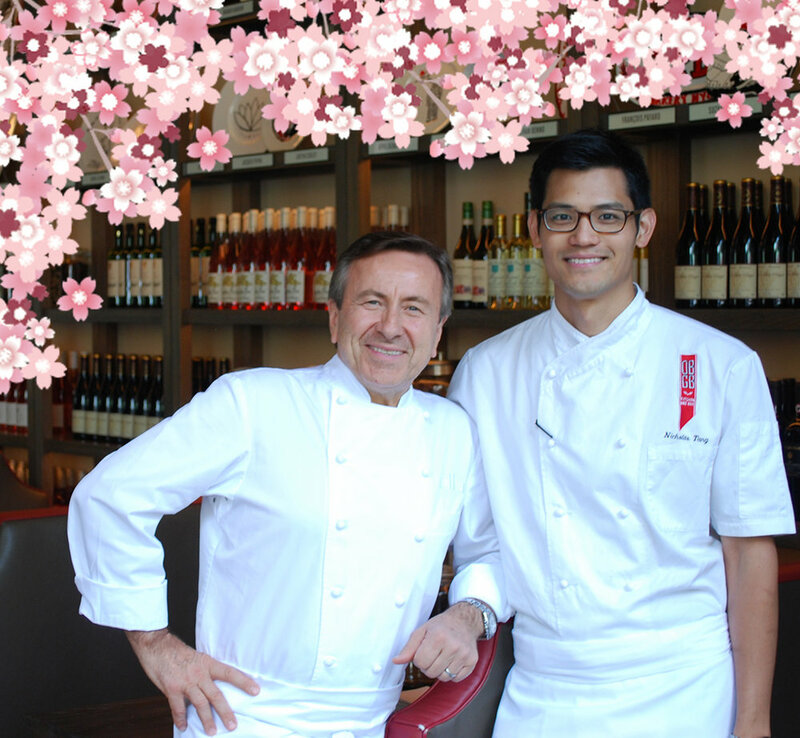 Ticket me this: On Friday, April 5th chef and restaurateur, Daniel Boulud, alongside Executive Chef Nicholas Tang, will host a ticketed spring feast dinner at DBGB, in celebration of Washington, D.C.’s Cherry Blossom Festival. Chefs Daniel and Nicholas will prepare a four-course prix-fixe menu with paired wines, in DBGB’s main dining room, located in CityCenterDC. Guests can purchase tickets for $148 per person (excluding tax and gratuity) by visiting the website, and reservations are available any time between 5 p.m. – 10p.m. Chef Daniel will be present throughout the night to chat with guests and introduce each course. A truffle making class at the Willard InterContinental on April 6 will feature a top chocolate maker, SPAGnVola. On April 6, the Willard InterContinental and SPAGnVola, recognized by National Geographic as one of the world’s best chocolate shops, will host a two-hour hands-on chocolate truffle making class. Guided by Head Chocolatier Crisoire Reid from SPAGnVOLA, participants will learn the artisan technique of tempering chocolate, the process of making chocolate ganache, and the steps to using ganache to handcraft your own delicious truffles to take home. Attendees will also have the opportunity to taste a variety of SPAGnVOLA’s signature bon-bon’s and truffles all while hearing from Eric Reid co-owner of SPAGnVOLA, on his experience as a cacao grower, and chocolate maker. Time: 3-5 p.m. Price: $65 per person or $100 per couple. At Buttercream Bakeshop, cake designers and dessert superstars, Tiffany MacIsaac and Alex Mudry-Till are doing a twist on a childhood favorite, the Hoho just for Cherry Blossom season. The snack cakes are rolled up and filled with a Cherry Buttercream Icing inside. Available as a special for $4.50 each. BOURBON STEAK at Four Seasons is gives a nod to Japan and its gift of our beloved cherry trees, as executive chef Drew Adams presents his version of a Katsu Sando: richly marbled cuts of A5 New York Strip Steak, accompanied by aromatic Shiso, Pickled Turnip, and rich Rutabaga Sauce, built on a sandwich on an authentic Japanese Milk Bread Parker House Roll. The savory combination is artfully served in a Bento Box – crafted from the Sakura wood of cherry blossom trees, and is available for $100. The restaurant will also be debuting a Sakura Spritz cocktail for $18, made with Raw Honey Syrup, Lindera Farm's Cherry Blossom Vinegar, Yuzu, Roku Gin, topped with soda. Occidental Grill & Seafood is celebrating with an effluvious Sour Cherry-Yuzu Gyoza for $10. The fried "dumpling" dessert has a Sour Cherry-Yuzu Filling, a blend of cherry jam and yuzu syrup. Served alongside of a scoop of fragrant, Cherry Blossom Gelato. Yum! At the Watergate! Cherries Jubilee. At the Watergate Hotel's The Next Whisky Bar, a delicious special for the season is the Cherries Jubilee to share for $19, presented with Macaron Cherry Blossom Cremeux and Nougatine. The Cherry Blossom Cosmo at Oceanaire. Oceanaire is featuring cherry-themed cocktails in honor of the season. Cocktails are priced at $14 each and will be available through the month of April, the In Bloom and the Cherry Blossom Cosmo. They were kind enough to share the recipe! Shake all the ingredients with ice, strain into a coupe glass. Garnish with a luxardo cherry. Thomas Martin is a junior at Yale University working toward his bachelor’s in English. A native of La Plata, MD, Thomas has worked as an intern, writer and social media specialist at Edible DC for a year.